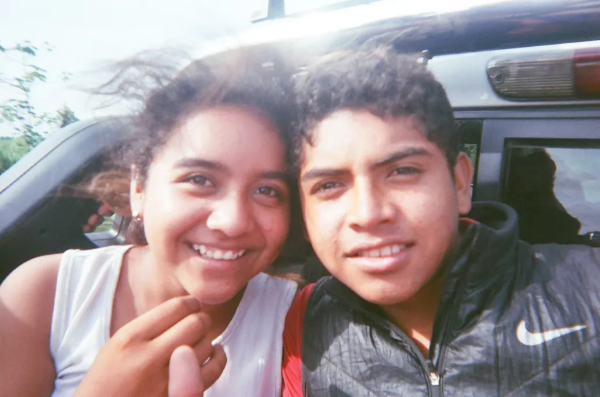 Buzzfeed News reporter Adolfo Flores gave kids in the caravan cameras to show what the experience looks like through their eyes. Ashlel Aguilera, 12, and Antonio Aguilera, 15, on the back of a bus in Southern Mexico. Photo by Antonio Aguilera. This analysis triggered some critical responses from other journalists. New York Times national correspondent Jose Del Real wrote in a Twitter thread: “It flattens an entire refugee crisis to economics, with no mention of violence, it disregards the love Central American parents feel for their kids, and doesn’t hammer home the scale of this problem. I guarantee this becomes a political talking point.” To which Miroff responded in a Twitter thread, “I hear your concerns and take them to heart. But too much coverage, I think, has ‘flattened’ (as you say) migration to a series of cliches and cudgels, ie they’re all fleeing violence, or they’re criminals. We have to push beyond that, ask difficult questions & report honestly.” He also wrote that concerns about political ramifications of reporting were troubling and more immigration journalists need to report from sending countries. One pull factor for Central Americans to migrate as families have been opportunities for asylum, Caitlin Dickerson explains on The Daily. But this avenue is rapidly narrowing under Trump. The Daily explores if Trump is dismantling U.S. asylum policy, or returning it closer to its origins, in an in-depth look at its roots after the Holocaust, political maneuverings, and expansion under Obama. But BuzzFeed reports that the 42 people who crossed into US territory and were arrested only made it to a no-mans-land between two border fences. And migrants insist the protest was peaceful, reports The Washington Post, until agents launched canisters of tear gas, which is banned in warfare. Immigration experts believe the confrontation is the “inevitable consequence” of Trump’s policies that make migration more difficult while ignoring the reasons why people must flee, reports BuzzFeed News. One Democratic lawmaker is calling for a Central American “Marshall Plan” after a border visit. The Department of Homeland Security is using undercover informants to infiltrate WhatsApp groups organizing the caravans, reports NBC. After Sunday’s confrontation, migrants in the caravan are struggling to choose their next move –staying in Tijuana, returning to their home countries, or crossing into the US — none of which are good options, reports the LA Times. On Monday, 30 migrants volunteered to return home, double the usual daily amount, reports Adolfo Flores of BuzzFeed News. In the town of San Ysidro, California, where 90 percent of consumers come from Mexico, hundreds of businesses lost a total of $5.3 million when the border was shut down for five hours on Sunday, reports The New York Times. Residents in southern Texas are struggling to adapt to an increasingly militarized border since troops were deployed, reports The Intercept. “Having the military here is a disaster,” one resident said. “Or more likely a tragedy.” At least 25 unarmed people have been fatally shot by Border Patrol agents in less than a decade as enforcement has harshened. U.S. government officials have insisted that the soldiers will be properly trained to interact with migrants. The U.S. and Mexico allegedly reached a deal for Central American migrants to stay in Mexico while they apply for asylum, according to high-level Mexican officials close to President-elect Andres Manuel Lopez Obrador, reports The Washington Post. On Tuesday, a Mexican official denied that such a bilateral agreement had been made but said the country must prepare to house Central American migrants while their asylum applications are processed, reports AP. Lawyers are helping the thousands of caravan members in Tijuana decide whether or not to apply for asylum, reports The San Diego Union-Tribune. About 70 percent of migrants will likely pass a credible fear interview, one lawyer predicts, but many may struggle to provide evidence for their cases. On average, 76 percent of migrants who cross the border pass a credible fear interview, reports Univision. About 20 percent of asylum claims have been granted each year since 2012, reports Politifact. A loophole in the injunction issued by a judge in June to stop family separation has led to at least 16 more cases of children separated from their parents, reports ProPublica. The ruling allows children to be separated from parents if their safety is at risk. Immigration officials have used a broad interpretation of this exemption to deem parents unfit or unsafe, often using a proven or alleged criminal record to justify the separation. The Trump administration’s family separation policy has cost at least $80 million as of Nov. 6, reports The New York Times. The price tag continues to grow as 140 children remain in custody without their families. A Guatemalan mother remains separated from her 11-year-old daughter, who was put into foster care when the pair crossed the border in May, reports The New York Times. The daughter was born in the U.S. and the law bars citizens from being held in detention. Immigrant advocates estimate at least 50 children are in similar situations. More than 2,000 employees at the Tornillo tent city, which houses hundreds of unaccompanied migrant children, have not undergone fingerprint background checks, which is required by the U.S. Department of Health and Human Services to ensure the safety of children, reports Vice News. The U.S. Interior Department, tasked with protecting natural resources in national parks and other federal lands, has taken on a larger role in immigration enforcement this year, reports ABC. The agency handed over 4,010 people to CBP from May to November 2018, compared to 126 people in 2016. A Mexican man who had been living in a church in North Carolina to avoid deportation was arrested last week during an immigration office appointment, reports The News & Observer. Democratic politicians accuse ICE of using the appointment as a false pretense to lure him from the church, where immigrants are usually safe from deportation. Undocumented immigration dipped to the lowest levels in a decade, according to a Pew Research Center study. New arrivals are declining, most significantly from Mexico, but instability and violence in Central America has led to an increase of migrants from Honduras, Guatemala, and El Salvador. In addition, undocumented immigrants from India and Venezuela increased, while there were statistically significant declines from Brazil, Colombia, Ecuador, Korea and Peru. An estimated 10.7 million undocumented immigrants lived in the U.S. as of 2016. Although there is no definitive data, it’s likely that most undocumented immigrants now are visa overstayers. Baltimore sued the Trump administration charging a new State Department visa policy keeps immigrants from seeking benefits, reports The Baltimore Sun. A New York court ruled that all immigrants charged with crimes deserve jury trials, reports WNYC. Lawyers who filed the suit believe a jury of peers will better ensure a fair trial for immigrants who could face deportation if convicted of a crime. The Trump administration has allocated $39.8 million to hire new judges and support staff to handle the backlog of immigration cases, reports CNBC. In comparison, sending troops to the border cost nearly double: $72 million. Corporate law firms have emerged as important challengers to Trump’s immigration policy, reports The New York Times. Lawyers claim their motives are not political, but critics say they are driven by a left-leaning bias common among top law firms. From New Mexico to Tennessee, attendance decreases when students are worried about their own deportation or a loved one’s deportation, reports NBC. This trend worsens when schools allow ICE on the property or collect information on immigration status, so some schools are changing their policies. Philadelphia, the city with the most aggressive ICE office in the country, has increased workshops to educate undocumented workers about their rights since Trump took office, reports The Inquirer. These trainings are part of a larger trend nation-wide, with cities in New York and California doing the same. Workers with visas for seasonal agricultural work, known as the H-2A visa, have more than doubled since 2010, reports Documented NY. The shifting workforce, previously dominated by undocumented workers, is making it more difficult for the workers to negotiate better working conditions because they are tied to their employers. Elsewhere, the agricultural industry is turning to technology to replace the shortage of labor, reports The New York Times.